When Ahn Wells makes and gives her work titles such as, One Big and One Small Dusty Pink Woolie Square (2011), 3 Dusty Purple Woolie Squares(2011), and 3 Blue Woolie Squares (2010) we are not necessarily surprised when what we see in the works turns out to be just that: squares. With the descriptive simplicity of the titles and the formal directness of squares, grids and cubes recurring throughout Wells’ work, it is tempting to group it amongst the crowded art historical narrative of ‘square art’. To artists of the early 20th Century such as Malevich and Mondrian, the square, with its equality of unified proportions was the very form of the utopian solutions to human progress, social justice and spirituality. The minimalists of the 60s and 70s not only adopted the precise grids and cubes of industry, but also their production processes. While comparison to any of these other creative engagements with the square would be art historically appropriate, it would also miss the point. 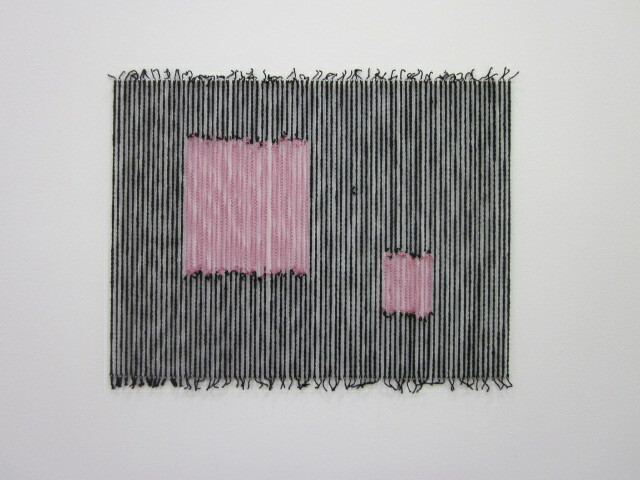 While Wells’ wall-based crocheted wool works make use of squares, they address much more than squares or the formal arguments about them. Despite their simplistic titles they are much more than an arrangement of coloured shapes. In fact these squares are not actually squares and much less are they pictures of squares. The pictorial format is used strategically as a device of illusion. At first glance these pieces look very much like pictures that include square shapes, but their construction is about as far as one could get from drawing or painting. Crocheted wool is stretched vertically between two parallel rows of nails. Some include a section of different coloured wool and when there are several of these sections lined up the illusion of a square is created. As simple as this device is, it creates a series of illusionistic suggestions to the viewer: lines pretending to be squares; wool pretending to be an image; three dimensions pretending to be two. As inconsequential as these suggestions may initially seem they are, in fact, disrupting the indifference with which we ordinarily view pictures. The seductive material quality of Wells’ work asserts the meticulous labour of its production as much as it hides it behind the idea of ‘a picture of squares’. This dual mode of address disrupts our reception of these works, at once a collection of parts and unified whole. In doing this, Wells reveals what we take for granted when looking at images – that they are also constructions of independent elements, that is, they are all illusions. When looking at images we have learned to look through the collection of pixels, ink or paint, we have learned to ignore materiality and just see images. A version of this tension is played out across all of Wells’ work. 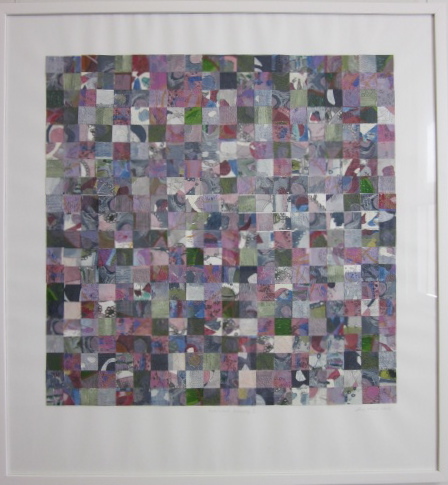 The Patchwork Drawings for example, utilise the grid pattern to recombine less rigid imagery that has been intuitively drawn, painted, sewn, scratched and pierced. The grid here however, functions less as the traditional modernist ordering principle but more like the intuitive traces of material actions that make up the original images. The grid appears more like an incidental by-product of the process of cutting out and mounting squares and less a deliberate patterning strategy. But it is precisely this kind of attitude to making that pushes Wells’ work beyond the purely formal investigations of ‘square art’. The process in all her work is laid bare, what we experience when looking at these works is not simply the spatial and material qualities of the work but also temporal duration. Time spent with the materials becomes a visual feature of the work. The traces of interactivity speak to the viewer on a physical level, reminding us that looking is not just a visual experience. Wells’ work is an intimate communication of the experience of making, but also of many other experiences that by their nature defy verbal or numeric expression. The constant tension between rigid order and intuitive freedom animates the work to the point that there remains the possibility, even in the finished work, that one could collapse the other at any moment. Like a square tenuously imagined through stretched string, we all struggle with the paradoxical desire for order and freedom. Wells’ work suggests that a resolution of this paradox may not be the outcome we need, but rather acceptance of it, is perhaps more rewarding.